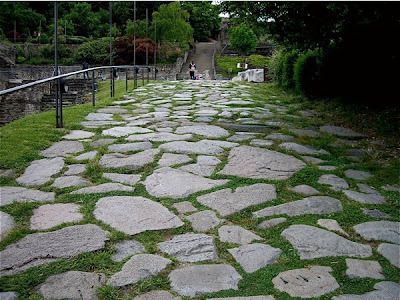 This is a road built by the Romans over 2000 years ago. 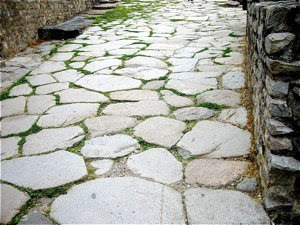 Paved roads like this are found throughout what used to be the Roman empire, and are as good today as they were when they were built. 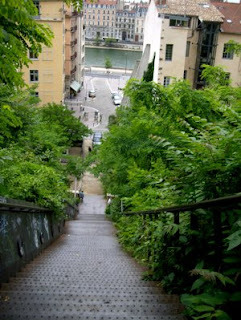 This one is found on the Fourvière Hill overlooking modern Lyon. Here the Romans built their first settlement in 43 AD and called it Lugdunum - meaning the hill fort of the god Lug. It is easy to see why the Romans chose the Fourvière as its location for the first settlement. The Fourvière hill is steep, and easy to defend, and from here you have a great view over the plains of the Rhône valley beyond. I chose the hard way, walking from the old city on the west bank, up the stairs, then up steep narrow streets, passing old buildings and walls, some may even date back to Roman times. The walk up the Fourvère hill is hard labour. As I walked up, it was humid, overcast and 20 degrees on the Celsius scale (68F), and I was soaking in sweat as I reached the top of the hill. But it was a wonderful experience to gradually rise over the roofs of the old city, getting a view over Lyon and the large plain of the Rhône valley. The original settlement on the hill covered more than 300 hectares and was the heart of Lugdunum for over four centuries. Much of what once was Lugdunum, have now disappeared. 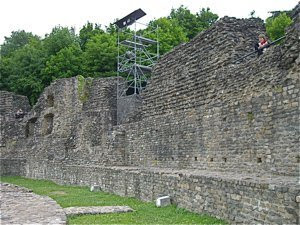 Only a few walls of the city are still visible above the small Odéon (right). The walls were even more visible in "Plan Scénographique de Lyon" from 1550, where most of the buildings of the renaissance city was depicted and described. Up here you find remains of other buildings, a large amphitheater, public baths, a forum, and a temple. The most impressive monument from the Roman era is the large amphitheater. It is classified as a UNESCO World Heritage Site. It must have been a very impressive building in its time. 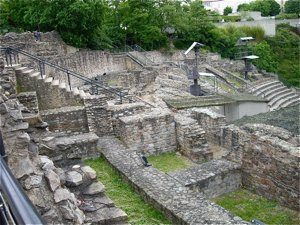 It is actually one out of two amphitheaters in Lyon. 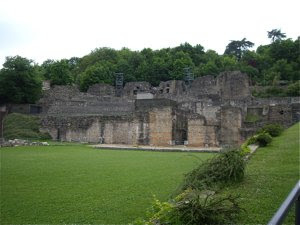 The other, l'Amphithéatre des trois Gauls" is found on the slopes of the Croix Rousse Hill, on the peninsula formed by the Rhône and Saone rivers. Here you may walk up, past what used to be terraces. Parts of it are in fact still in use. As I was there they were rigging the scene for an event. 2000 years of entertainment - eat you heart out, Hollywood!! To give you an impression, I took a short film showing the theater and its surroundings. When visiting the city of Lyon, I highly recommend you to take the extra effort and walk up the Fourvière hill to see both the remains and the impressive Basilica. It is a walk up a hill, as well as a walk through history, from the renaissance city below, whose ideals built on the classic culture, back to the Roman era - its inspiration. Lugdunum was also the starting point for four large routes. From here the Romans built main roads to Italy, Aquitaine, the ocean, and to the Rhine. So if you want, you may take a step or two on the Roman road, close your eyes, and try to imagine all those that once walked here.